Since my SWEP1 arrived, the lightsaber Neon has been unreliable. Some days it works and others it won’t start up at all. In other cases it might finally kick in part way through a game or just stop working during a JEDI battle. It was a little random. The general work around for it was to adjust the two wires coming from the lightsaber, which would usually get it working again. At least for a day or so before it stopped again. This gave me hope it was a connection issue instead of a driver board issue. Last week the Neon completely stopped and no manner of wire adjusting would get it back on. Enough is enough – time to fix the damn thing properly. 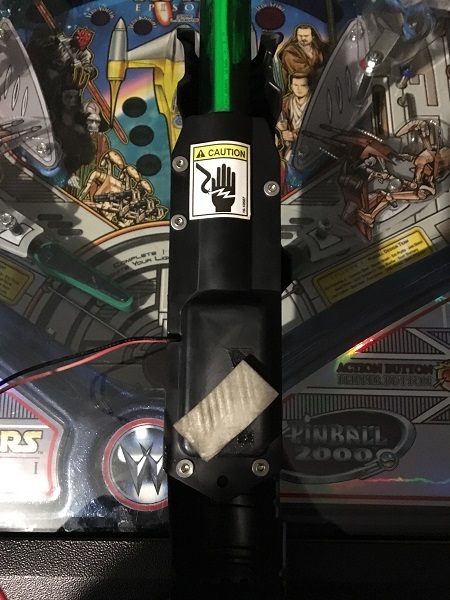 There are two probable causes – an issue on the driver board or the 12V transformer inside the lightsaber. 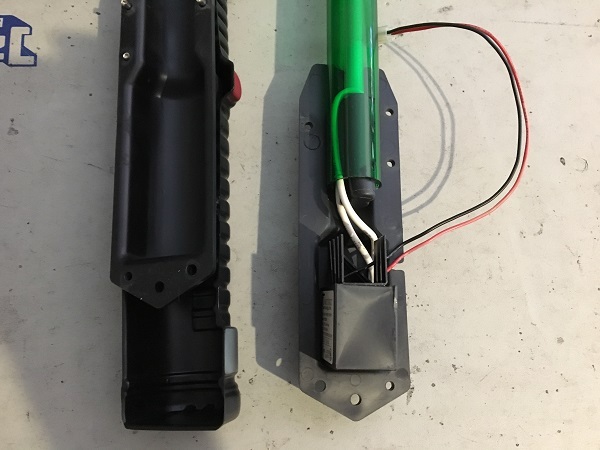 I disconnected the power connector for the lightsaber and using my DMM, tested the voltage it was receiving. The driver board was doing it’s job properly and the correct voltage was coming in. I was fairly confident the issue was with the lightsaber, but this at least clarified it. So the lightsaber was removed for a closer inspection. It isn’t easy to get to the transformer inside the lightsaber. The handle is closed together with several rivets. The 5 rivets were carefully drilled out from the casing so I could access the transformer. I had hoped to find a loose wire being the cause of the neon failure, but both power wires from the game fed inside the transformer. Another two wires that connect to the neon tube come from the transformer and they lead inside the transformer too. So looks like a replacement is what’s needed. 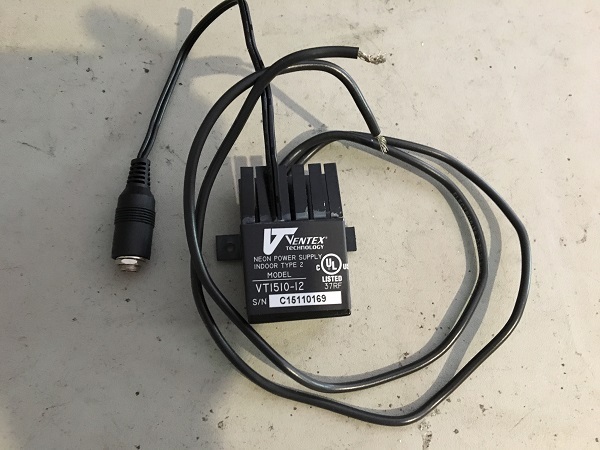 A new 12 volt transformer was purchased to install. These aren’t plug and play and it will need some tweaking to get it into the lightsaber. There are two mounting tabs which allow the transformer to be screwed in – these will need to be cut off. The power supply cable will need to be cut and joined with the connector from the old transformer. 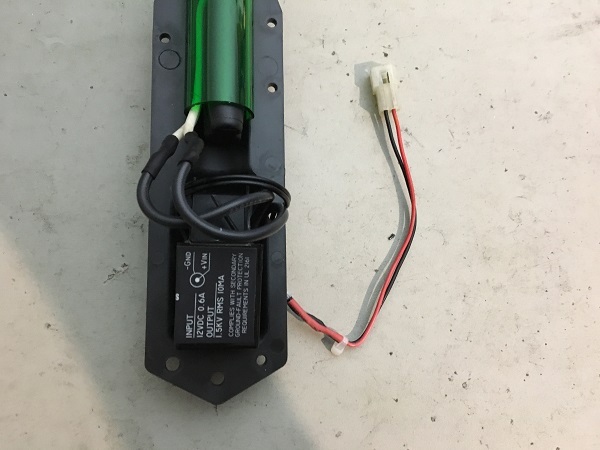 The two wires coming out of the transformer will also need to be joined to the existing wiring on the Neon tube. The power wiring was transferred from the old transformer so the new one could plug straight in under the playfield. The two out wires from the transformer were hooked up to the Neon tube. It was ready to be put back together. 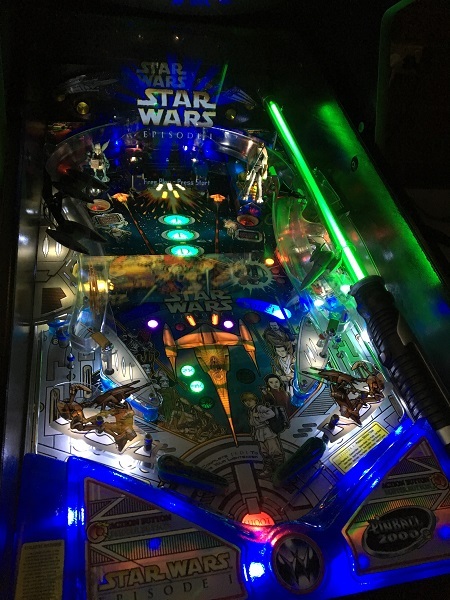 The lightsaber housing was joined up again and hooked into the game. Once the start up sequence completed and the game entered attract mode, the light saber lit up brightly and was working once again.